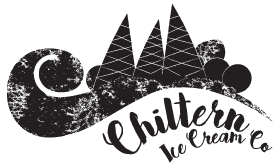 Hello we’re an artisanal ice cream maker based in Chilterns area of outstanding natural beauty. We’re passionate about the Chilterns (hence the name) and to us that means seeking out Chiltern based purveyors that are as obsessed with unique products of the highest quality as we are. We believe to make great Ice Cream & Gelato you have to start with exceptional milk and cream, not all are created equal. Ours comes from the Chilterns based Laceys Family Farm’s Guernsey herd. The richly flavoured, textured and coloured Guernsey milk & cream produces ice cream and gelato of exceptional character, creaminess and quality. We produce both! Though most of what we make is based on our own in-house Gelato formulation. Isn’t Gelato Italian for Ice Cream? Yes, but there are a few more differences than just the name. The most notable being that Gelato contains more whole milk and less cream than Ice Cream, a bit more sugar and is served at slightly warmer temperatures. Some have argued that the reduced fat makes it healthier. We won’t go that far but we do think the lower fat content allows the great flavours we’ve crafted to come bursting through. Whichever you prefer, we craft our creations to be super creamy, taking indulgent to an entirely different level! Sorbet often gets a bad rap, unfairly accused of being gritty, icy and somewhat tasteless. If that’s been your experience to date, let us transform your impression of what sorbet can be, a flawlessly creamy indulgence without the slightest hint of iciness and bursting with natural fruit flavours. Our sorbets don’t contain any dairy and are suitable for vegans. As new producers you’re probably thinking 3 flavours, at a stretch may 6, so you may well be surprised to hear we have over 30 and add new flavours every week! As an artisan producer we can create flavours in very small batches and we’re always experimenting! Of course there will always be favourites, once again Sea Salted Caramel is topping the list but a new contender Double Honeycomb is vying for the top spot. We strive to keep the ingredients list very short, we definitely don’t like additives its an ongoing challenge but we’re committed to keeping our labels clean. We only use real ingredients, no flavourings (natural or otherwise) or colours. Our preference is to use other local artisans to supply our ingredients, if we can’t find someone we make them ourselves and if we can’t do that we don’t make it, its the best or nothing, for us there’s no room for compromise. We aim to make as many of our products gluten free as we can. Most are but some we can’t avoid, typically those that include biscuit and brownies aren’t but we’ll be including a gluten statement on labels to let you know which are and which aren’t. Our sorbets are all gluten free though. We’re adding places all the time, all in the Chilterns. They’re most typically cool local cafes, earthy farm shops, historic homes and great foodie pubs (emphasis on amazing food). We’ll put up a list soon once we’ve figured out how to use the websites map features!